In this print awareness worksheet kids get another opportunity to count the number of letters in a handful of words. 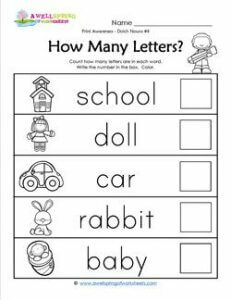 The words on this worksheet – school, doll, car, rabbit, and baby – are all Dolch nouns. Have kids count the letters, write how many in the box, then color the objects.